CAMPFIRE SMOKE: This smoky wood scent will send you back to summer nights around the bonfire, warm and inviting with a hint of the outdoors. CANDY CORN: Just like the halloween candy! A well rounded blend of vanilla & caramel. PUMPKIN EGGNOG: Fresh pumpkin, sprinkles of cinnamon and clove, creamy vanilla custard and background notes of fresh apple, musk and cedar. PUMPKIN SPICE: Warm pumpkin with a blend of cinnamon, clove & nutmeg. SMOKY MOUNTAIN: A warm smokey scent like that of a crackling fire with a hint of cedarwood. Blends so well with the primitives, like being in an old log cabin! SWEET CINNAMON PUMPKIN: Sweet pumpkin pie, cinnamon, brown sugar and freshly whipped cream. Sweeter and more pumpkiny than our pumpkin spice. TWILIGHT WOODS: This warm musky blend opens with citrus highlights that accent a heart of fresh white flowers. Lily and muguet bloom in a soft bouquet as a highly textured wood complex soothes the senses. Exotic musk is sweetened with golden amber and black vanilla at the base of the scent. 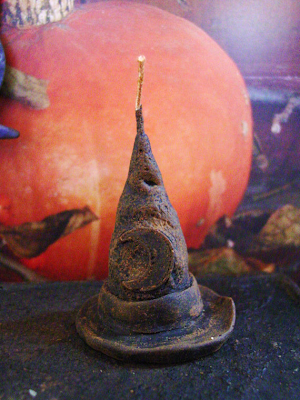 WITCHES BREW: A celebration of patchouli, cinnamon and cedarwood.